As an alternative lender for those unable to secure funds through traditional lenders, Kabbage can be a path to obtaining what you need to keep your business going through a rough patch, product rollout or other unforeseen circumstance. Kabbage has become one of the go to lenders on the internet and offers many advantages, simplicity and speed of access being among the most valued. 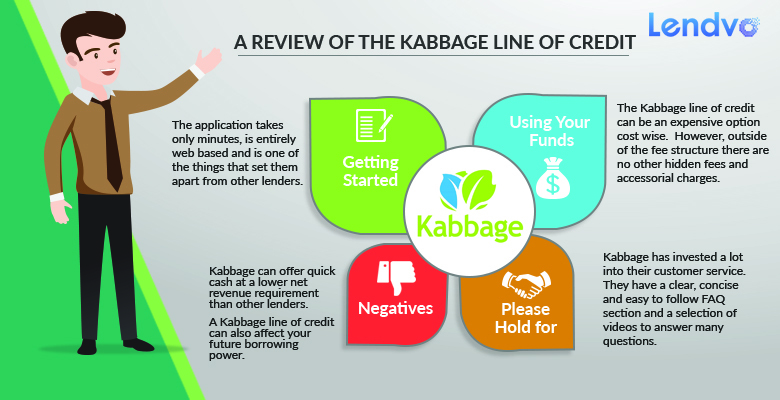 Kabbage loans are available to business owners with bad or questionable credit: Most Kabbage borrowers have credit scores of over 500 but it is not unheard of for lower rates to be approved. In addition to traditional methods of assessing your credit-worthiness Kabbage uses a system whereby key business accounts – such as your bank account, PayPal account, Amazon store, accounting software and other accounts can be linked directly to their system. This information is used to determine the credit limit you will be offered and set the fees for use of the loan and for payback. The linked accounts are used in consideration for a loan in addition to your average monthly revenue and how long you have been in business. Kabbage offers quick access to cash: While the fees will function over time as a high equivalent to interest rates, for those willing to trade rates for speed of access Kabbage delivers. The application process is simple and doesn’t require paperwork. In most cases the application takes less than ten minutes. And the funds are usually available within zero to three business days for a business checking account and minutes when using PayPal. Front-Loaded Fees: Because the loan fees are front-loaded you will pay higher fees in the first few months, decreasing as the loan payoff date nears. Thus, there is very little incentive to pay back early even though there is no fee for doing so. Complex Fee Structure: Kabbage has a complex fee structure. Loans for Kabbage come in either six month or twelve month terms. The fee will range from 1% to 10% based on your credit worthiness as discussed using the method above. High Rates: Kabbage loans carry high rates. Kabbage’s rates can be as low as 24% and as high as 99%. Because the cost of the loan is so high, careful consideration must be used in making decisions on how to use the funds. Some purchases, such as heavy equipment, can be financed or leased through the equipment provider at a lower rate. A borrower must be in business for a minimum of one year. First year startups or those looking for startup funds must seek alternative loan sources for businesses in operation for less than a year. A business must have annual revenue of at least $50,000. Alternately, a business must have had revenues of at least $4,200 per month over the last three-month period. You can withdraw from your funds up to once a day. This can be done by phone app or computer making the process fast and easy. Once you make a withdrawal, the funds are available within 1-3 business days into your bank account. If you are using PayPal the funds are available within minutes. You can withdraw incrementally. If you use the cash incrementally you are only charged for what you have used. In the coming months Kabbage will offer a Kabbage card to allow you to use the funds through a backed card such as MasterCard to withdraw funds and make purchases. This feature is not available as of August 2017, and is listed as “Coming Soon”. Each month you will be required to pay back an equal amount of the money used plus the fee. If you have taken money incrementally as discussed above, and you have paid back the incremental portion you are not charged the fee. The fee only applies to outstanding balances. You can set your payment up for automatic withdrawal each month. If you have more than one Kabbage loan they will offer to consolidate them into a single payment for the sake of convenience. Kabbage offers speed and ease of funds but at a higher cost than traditional lenders. Its system of evaluating credit worthiness can make a difference when you need cash quickly. And in the event you don’t qualify, you don’t have to reapply. Kabbage can stay linked to your accounts and determine and notify you in the event that you reach a threshold of approval. As in all loans, each borrower must assess their own need, risk and credit exposure when applying for funds from any lender.